The New Years Eve rituals continued at the Lavender and OLiVE household, starting with assembling the Osechi boxes on the New Year’s Eve at the in-law’s house. We started earlier this year at 9:00 a.m. instead of the usual noon so we could be home in time to prepare for the NYE party with our friends at home. Matchstick daikon radish and persimmon marinated in vinegar. This is a new menu added to Osechi this year, thanks to abundant crop of the fruit in grandmother’s backyard. Thinly sliced lotus roots marinated in plum vinegar. Mashed chestnuts and yam cooked in syrup, with chestnut on top. It’s very similar to the Italian dessert, Monte Blanc, and very lovely. Fried wakasagi marinated in sweet vinegar. Pounded burdock roots cooked in dashi, soy sauce, mirin, and sugar. Yes, as the name indicates, these poor little branch-looking burdock sticks are pounded with a rolling pin into submission, but don’t fret, they come back as delicious vegetable dish. Shredded carrots and daikon radish marinated in sweet vinegar. It’s very similar to the persimmon and daikon sunomono, but the vegetables are shredded much thinly than its red and white cousin. Dried sardines cooked in soy sauce. Soy beans cooked in brown sugar. 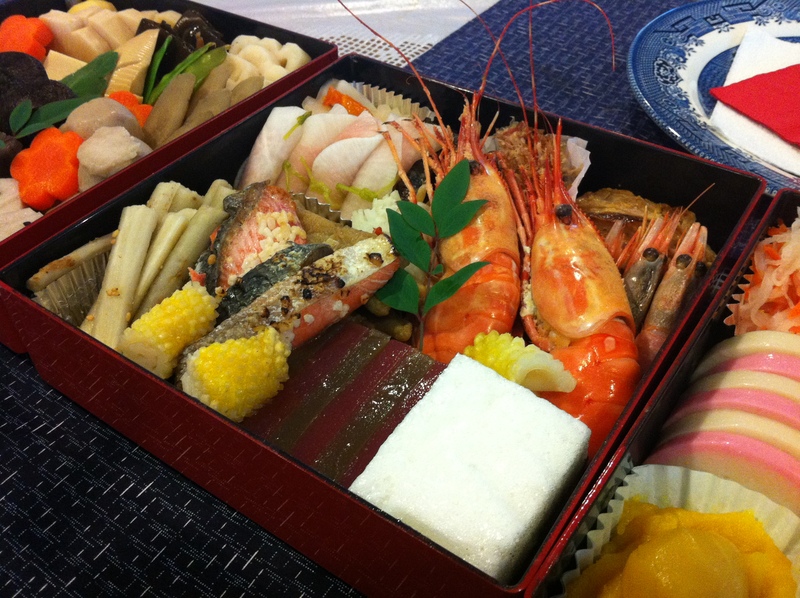 Okara (おから): This is my favorite dish in Osechi, and I don’t know the proper name of this dish! Okara mixed with marinated mackerel, radish, and carrots. This is pure deliciousness. Chrysanths flower made out of radish. Red and white fish cakes. Smoked salmon rolled in paper thin radish marinated in vinegar. 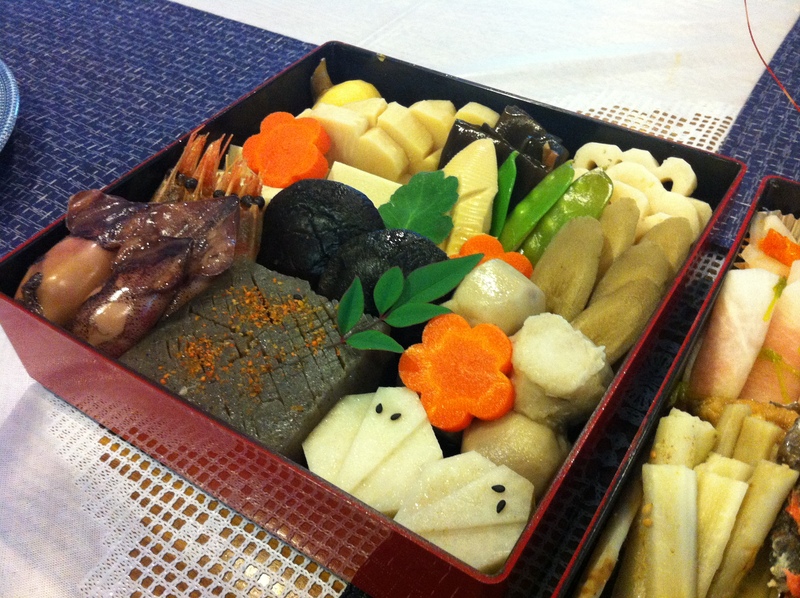 There’s an art in packing each item in the ojyu, or Osechi box. The second layer, or “nino jyu,” contains seafood. So, after we were done with Osechi packing, we headed home to prepare for the shabu shabu dinner party we were hosting. It has become a ritual for the four of us to enjoy shabu shabu on the NYE. Last year, we only make it to 10:00 p.m. before everyone passed out, but we actually make it past midnight this year! I wish everyone a happy, healthy, and prosperous 2015!